Reports from U.S. customers of T-Mobile reported problems with service nationwide, though not with every customer, and, according to the Company, only affecting 5% of their (active?) users. Problems were reported from San Francisco to Long Island and Tennessee, according to CNET's Ina Fried. T-Mobile's troubles last month are on every analyst's mind, though it's unlikely there is any connection, unless it's another lapse in supplier service level. 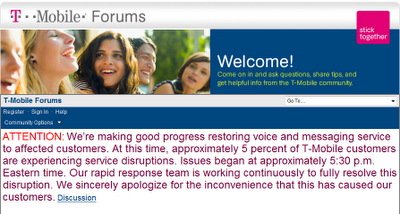 TMobile's forum landing page posted the announcement below. The screenshot was captured at 21:23 Eastern.